Alto Adige Schiava Gschleier "Alte Reben"
160 large and small wineries produce and market 330,000 hectoliters of wine (equivalent to 40 million bottles) of wine every year. 60 percent of the quantity produced is white wine, 40 percent is red wine. Vineyards along the Adige and Isarco Rivers range from 200 to 1,000 m. (600 to 3,300 ft.). (600 to 3,300 ft.). 20 grape varieties fi nd their perfect locations, thanks to the ideal combination of variables. 300 days of sun and 500-800 mm. (20-31 in.) of precipitation per year are the ideal conditions for winegrowing. 3,000 years of winegrowing history and the oldest German-speaking winegrowing area. 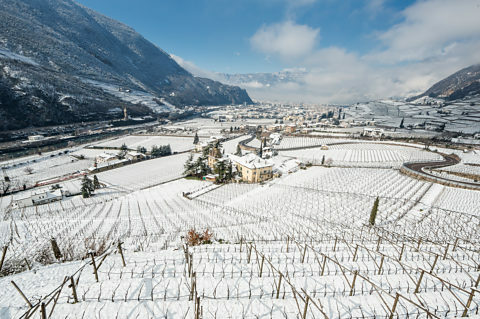 One third of Alto Adige wine is exported abroad. With around 5,400 hectares of vineyards and barely one percent of the country’s total wine production, one of Italy’s smallest winegrowing areas. 330,000 bottles of Alto Adige sparkling wine are produced each year exclusively according to the classic méthode champenoise bottle fermentation process. 98 percent of the total vineyard area is DOC classifi ed, number one in Italy.